Over 60 people protested Monday in Springfield against a legislative bill, HB 2615, that if passed will bring hydraulic fracturing (“fracking”) to Illinois. Illinois People’s Action organized the grassroots rally and lobby action, joined by Southern Illinoisans Against Fracturing our Environment (SAFE) and Food and Water Watch. People arrived in the capitol early in the morning, many carpooling in a caravan from Bloomington-Normal, stopping first at the Northfield Hotel where a pro-fracking seminar hosted by the Association of Illinois County Board and Commissioners was taking place. It was known that the seminar – run jointly by business, large environmental NGOs, and state regulators – would promote HB 2615, or “regulated” fracking, as the only way forward on the issue. IPA held a rally outside the hotel, leafleting and speaking with county board members and commissioners from across the state. Amid the lively chants in the hotel parking lot, numerous speakers addressed the crowd. After greetings by Cristina Deutsch and Reverend Charles Jackson, Bill Rau outlined the fatal flaws with regulating fracking through HB 2615, and Annette McMichael of SAFE spoke passionately on how her property rights would be threatened by fracking operations in southern Illinois. Illinois People’s Action members and allies then traveled to the state capitol to meet with Governor Quinn and give him petitions that contained over 600 signatures opposing fracking in Illinois. The governor was not in the state, but his staffers met with IPA representative Barbara Heyl, denying a meeting with the entire group. Concluding the day, IPA held a meeting with the office of Attorney General, Lisa Madigan, to share displeasure with HB 2615, labeling it a defeat for ordinary citizens and grassroots environmentalists. 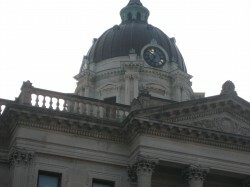 Representatives for Lisa Madigan defended the fracking bill as inevitable once lobbyists could not find enough support at the capitol for a moratorium. Her office, and a number of organizations in the Illinois Environmental Council, decided to support “regulated” fracking after the failure of their ineffectual behind-the-scenes lobbying of legislators. IPA’s leadership team criticized the bill for its many flaws, and disagreed with the very notion that fracking could be made safe by regulation. The Attoney Genral’s office claimed that HB 2615 provides the strictest regulations of fracking in the country, to which Dawn Dannenbring-Carlson responded “Strict does not mean safe.” As Bill Rau pointed out, the bill does not do enough to protect our air, water and land in Illinois. It was also pointed out by Dawn Dannenbring-Carlson that the “environmentalist” negotiators were cherry-picked by Representative Bradley, and anti-fracking activists were denied a place at the table from the beginning. McLean County Board Member, Victoria Harris, speaks out against fracking prior to the seminar organized for Illinois county board members and commissioners. IPA representative Barbara Heyl reports back from her meeting with Governor Quinn staffers. Staffers refused to meet with IPA as a group. Illinois People’s Action holds a meeting to oppose pro-fracking legislation, HB 2615, with the Attorney General’s office. I’m not in favor of fracking in Illinois, but I am in favor of HB 2615. Your opening statement, “HB 2615….if passed will bring hydraulic fracturing (“fracking”) to Illinois” is misleading. It sounds as though fracking is not legal here today, and that is absolutely not true. There is nothing preventing fracking from starting in Illinois today. I suggest you read the existing laws governing oil and gas extraction in Illinois and contrast them to the provisions in HB 2615. Do we really want fracking in Illinois under the current regulations with no requirement to contain waste water in sealed containers, with no requirement for baseline water testing, with no requirement chemical disclosure, with no requirement for published public notices and provisions for public hearings and appeals, with no requirement for changes in the statute should bi-annual DNR assessments show a need? The list goes on, but I hope you get the idea. Before people continue with the push to kill HB 2615 they need to know that killing the bill will not kill fracking in Illinois. Do people really think we’re better off with the existing regulations? Thanks for the comment. Our position is that we don’t want fracking in Illinois, period. It is not safe and we don’t trust the regulations nor the ability of the state to regulate. What did the large environmental organizations in Illinois do to build a bottom-up movement in Illinois to oppose fracking? I’ve been aware of the issue for over two years and have heard almost nothing. From my understand, large-scale fracking has not commenced because the industry was waiting for a bill to cover them; now they have their bill with the support of large environmentalist organizations. I count this as a major defeat when people negotiating in our name put all their resources into lobbying with very little leverage. Now, from what Sandra Steingraber says, the movement in New York is being pressured to collaborate and give in to fracking because of our willingness here. This is a national defeat for the movement. T. Treacy offers us a false dichotomy. It’s either HB2615 or unregulated fracking. There is a double error in this illogical fallacy. First, it ignores Senator Mattie Hunter’s Moratorium Bill, the legislative alternative to HB2615. Second, it falsely assumes that HB2615 regulates fracking. It does no such thing. It is a DE-regulation bill that exempts shallow fracking, which will be both the most common and most dangerous kind of gas fracking in IL, it allows fracking in the Wabash Valley earthquake zone, where the next Big One will most likely be located, and gives legal sanction to the risky and uncontrolled dumping of radioactive brine. Permit bonds are also set so low that drillers will forfeit them and leave the expensive clean up and well plugging costs to the taxpayers of Illinois. They will also use radioactive brine as a “dust control agent,” to temporarily suppress dust when big rigs are running 24/7 on rural road (Illinoisans will be eating radioactive dust the next summer), and they will sell it to county road crews to use as a de-icer in the winter. I could go on for another two pages on why this bill is an Environmental Munich with large areas in Southern and Central Illinois playing the role of Sudetenland. Congratulations, fossil-fuel sponsored “green groups.” You’ve given us a doozy. My understanding is that fracking has not begun in earnest in Illinois because the gas/oil industry needs the cover of a state law to “regulate” their operations. H 2615 is not that law. As the fracking movement has gained momentum across the country, I have tried to follow industry/State of Illinois developments, but except for members of our County Board who understood how such planning has evolved in the past, and who believe in their duty to keep citizens informed, I had not read/heard of any regulatory legislation – until HB2615 was unveiled. And never in the past two years had I read/heard of any kind of legislation that would ban fracking outright or place a moratorium on fracking pending – at minimum – public hearings and opportunities to express opposition to fracking. I believe that opposition would have been clearly expressed beginning with concerns for water usage (the City of Bloomington relies on two lakes for its drinking water – are we expected to give up millions of gallons of that precious resource? ), frack water disposal, seismic activity , land owners’ rights, and local/county control of fracking operations. Our county has strong land use regulations and a history of energetic citizen input. My understanding of HB2615 is that our County Board would no longer be able to regulate land use in ways that protect fresh water usage, chemicals used in the fracking water, frack water disposal, location of fracking operations, and the property rights of land owners. Tracy, while Sierra Club, Faith in Place, NRDC and the A.G. are saying it is the “strictest bill in the country,” they are confusing “strict” and “safe.” As Rich Fedder of SAFE so clearly puts it, these terms are not synonymous. There is no such thing as safe fracking. I just returned from the national Stop-the-Frack-Attack Conference in Dallas, TX where HB2615 was a big topic of conversation. Experts all over the country have studied the bill and say that the claim that it is the best regulatory bill in the country is simply false. State after state is passing “regulatory” bills and every state is claiming theirs are the “strictest” and the “best.” IPA has not drunk the Koolaid. As Susan says, “What’s the rush?” If all the “insider” groups that participated in behind-closed-doors negotiations had, instead, been mobilizing the public, we would be that much further along in getting a ban.